Notification is a feature for users who want to be informed about Content changes in the system. Users can subscribe to notifications on possible changes to Content items. Notifications are email messages sent to the subsriber’s address. These Content changes can be any kind of change like making a new Content, editing, deleting, renaming, copying or moving an existing Content. The subscriber will receive emails about these Content changes. For these emails custom templates can be set that may contain dynamic parameters, filled with content field values. Subscribers can edit their own subscriptions, but do not have access to others’. Only user administrators can view, edit, delete, activate or deactive notifications for the users they have access to (see details below). Notification is turned on by default. To turn off this feature you have to disable it in the application configuration file. For details, see the Configuration section below. Users will be able to subscribe only if they have an email address in the system. If their email address changes, all their notifications will be sent to their new email address from than on. 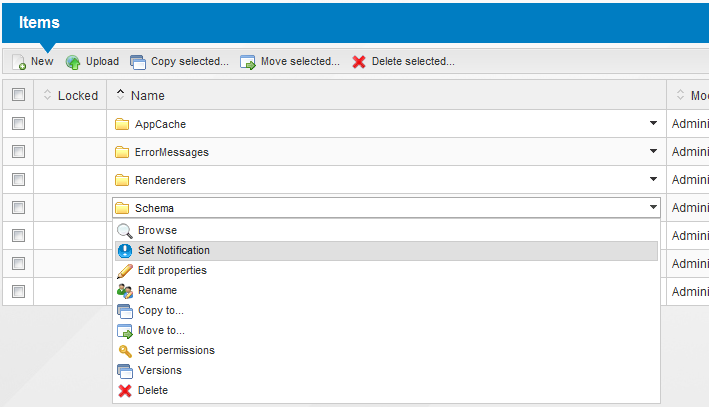 Notifications can be set up for any Content in the system easily in any list or library or in Content Explorer. You have to click the dropdown action menu on a Content to get the list of avalaible actions and select the ‘‘Set Notification’’ action. You also have access to workspace notification settings in the top right corner of your workspace dashboard (Workspace actions menu). The Edit link leads you to the notification edit page where you can see and even change the details (frequency, language) - or switch on notifications temporarily by inactivating the subscription. A user can not have more than one notification for the same content. Notifications are bound to content paths in the repository. That means if the content path is changed (e.g. the content was moved), all the notifications related to that content will become invalid. In the list view you can even delete notifications by clicking on the ‘‘Delete’’ button. The notification will be deleted at the background, the user won’t be notified about this event. This feature requires a mail server to be cofigured in web.config. Please make sure that you added this fragment filled with the address and optionally access credentials to your mail server. The notifications are sent periodically in one email per subscription or per user. Events’ descriptions in the monitored periods are aggregated in one email. There are four configurable time frequencies. Every frequency can be switched off using the “Never” keyword. By default grouping notifications by user is enabled. Instant emailing is done only in certain intervals to avoid performance degradation. We recommend that the notification’s heartbeat should be a couple of minutes (2-10). The default setting is 5. This period can be configured in three different ways. If the setting is “4th Sunday 1:00” and the current month does not have 4 Sundays, the mails will be sent on the 3th Sunday. Use “Last” keyword instead of 5th weekday. If the current month is shorter than the configured “Every” day number, the mails will be sent on the last day of the month. It is recommended that notification processing happens when the server is in a calm period so configure times sometime during the night if possible. Use longer periods for instant mailing e.g. 5-10 (or more) minutes. Do not use the monthly period if it is not important. The event collecting for subscriptions during the longest period can use a large amount of memory. Use the “MasterSwitch” instead of switching off every frequency. If the master switch is on, the events are still recorded in the database, even if messages are not sent because of other config values. NotificationSenderAddress: this email address will be set as the sender address in notification messages. RetryCount: if an error interrupts the message sending process (e.g. TransactionFailed) the system will wait for a while (defined in RetryDelay below), then tries to send the message again. RetryCount specifies the maximum number of these iterations. RetryDelay: time interval between two message sending attempts (in millisenconds). TakeCount: number of messages that will be retrieved from the message queue in each sending iteration. MessageEncoding: codepage name that will be used in messages (e.g. iso-8859-2, utf-8). Notification messages are emails that are constructed based on templates in string resources. To modify these messages you should navigate to the /Root/Localization folder in the repository and edit the MessageTemplateResources.xml resource file. Templates are multilingual and can be customized according to your needs. This section lists the available template variables you can customize for different sections and frequencies. You can use the following keywords inside the templates. They will be replaced with proper values.